The slope of Mt. Semeru holds a lot of beauty, especially when you are in Ranu Pani Village, Lumajang District, East Java. 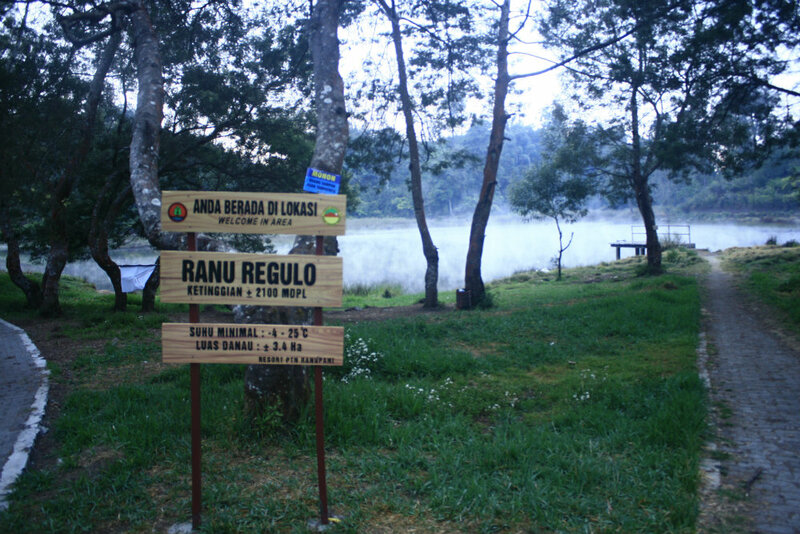 A charming ranu (in English is lake) cluster awaits you, one of them is Ranu Regulo. Ranu Regulo is the nearest lake from Ranu Pane village center. Located at an altitude of 2100 masl, the charm of Lake Ranu Regulo stretches an area of ​​0.75 hectares. You just live trekking down the hills and gardens of citizens to reach it. Distance from Ranu Pane Village center is about 2 kilometers or 15 minutes drive. The views of surrounding plantations with vegetable crops will soothe your eyes. Do not forget to take time with chatting or just greeting the people around. Arriving at Ranu Regulo, you will see the lake that is still very natural. The turquoise waters are surrounded by hills and trees that suitable for unwanted fatigue. Temperature of 10 degrees will surely envelop the traveler while visiting there. Written on the board, the temperature in Ranu Regulo can reach -4 degrees Celsius. In addition to enjoy the beauty, tourists can also fishing and camping in the vicinity. Not far from the edge of the lake ,there is also a building owned by Bromo Tengger Semeru National Park, which serves as a special research office Ranu Regulo. One of the unique flora that are cultivated and studied in this national park is Green Orchid. You can see it around the edge of the lake, amongst the bushes of trees.